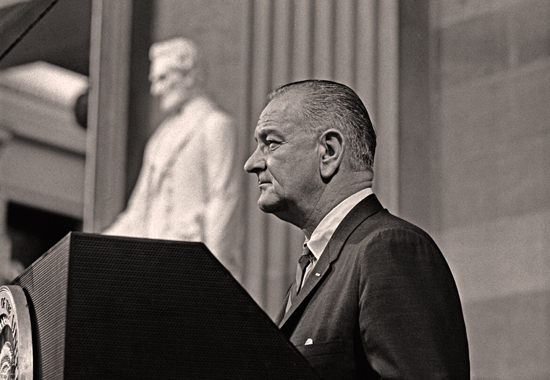 PRESIDENT LYNDON B. JOHNSON AT WASHINGTON D.C.
Go here for more about Lyndon B. Johnson's We Shall Overcome Speech. Video clip - Here is an excerpt of Johnson's speech. See text transcript below. It follows the full text transcript of Lyndon B. Johnson's We Shall Overcome speech, delivered at Washington D.C. - March 15, 1965. But now I do have that chance--and I'll let you in on a secret--I mean to use it. And I hope that you will use it with me. I want to be the President who educated young children to the wonders of their world. I want to be the President who helped to feed the hungry and to prepare them to be taxpayers instead of tax eaters.